After a very long trip, I have arrived in Switzerland. It’s a funny thing, because Switzerland and I don’t have the best relationship, but I’m here often enough that it’s familiar, and I can mostly find my way around and be unobtrusive. Why do I want to be unobtrusive here? Well, because Swiss politics, while vastly different from US politics, have a significant dose of cruelty in them. That cruelty is usually a mix of racism and religious intolerance; remember, this is the country with the political party that brought us the anti-minaret initiative that featured posters in which minarets that looked like missles were spread over the Swiss flag while a woman in niqab looked on. Other posters from that party, the SVP, which is particularly popular in the area I am visiting, have included things like black sheep being kicked off the Swiss flag by white sheep, and white crows attacking black crows shown trying to rip the Swiss flag apart. I could go on, but you get the idea. So I was oddly relieved when I saw that the worst the SVP seemed to be dishing out this week was simply a poster that translates to, “More Foreigners = Fewer Jobs.” We all still know what they really mean, but it feels a little less assaultive than usual. On the other hand, then I found this while going grocery shopping. It’s one of several I’ve found in this town today, all defaced the same way: Jew. Anti-semitism, of course, isn’t something unique to Switzerland or Europe, but my experience of it here is markedly different than my experience of it in the US, and particularly in New York, where, yes, even with the large Jewish population, I’ve experienced related slurs a handful of times. Secular Judaism here in Switzerland seems to be a pretty foreign concept, and Judaism is viewed as a clear racial difference with what is to me shocking frequency. So even when reactions to Jewishness here aren’t overtly toxic, they can feel a little weird. People that I am friends with here are curious about my Jewishness; they ask me, “what is it like?” and they tell me stories about their families and the War. I don’t mind the stories, because I have the luxury of not minding them; the Jewish side of my family came to the US long before WWII, and I’m a huge history buff. It’s honestly fascinating to me to be given these insights no matter how awkward the reasons. But I don’t ever really know what to say. I can’t absolve or reward people for actions taken long before my birth, that didn’t impact my family, and that have nothing directly to do with the people telling me the stories. And for me, who is not religious, trying to explanin what it’s like to be Jewish is just weird (I think it would be weird even if I were religious); it’s like the same way I am also Sicilian. There are words I use, in-jokes, food I like, and a sense of the world my family came from, versus the one I live in. It’s unremarkable, and nothing I can explain. But here it is different, in a way I also can’t explain despite the efforts of this post. And as terrible as it often is (I have been chased out of stores by old women flapping their hands at me and naming what I am), it’s also interesting, valuable, and terrible to come somewhere where how I am perceived is completely different than how I am perceived at home (I am also, often, asked about my racial makeup here; I am not read as white in the same way as I obviously am at home). All of that said and without ignoring or minimizing it, this is a beautiful little town. Exquisite, really; it even has a reindeer viewing park thing by the medieval church. I’ll try to get pictures for you. 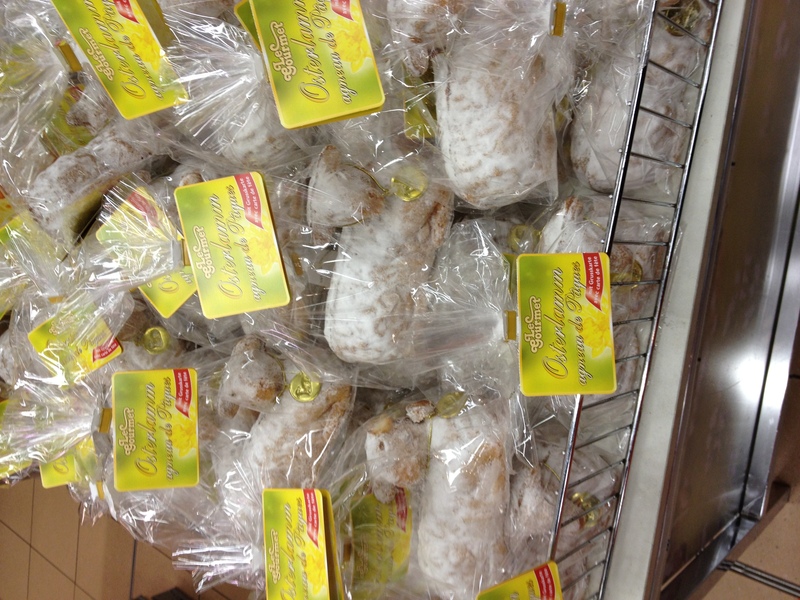 But, in the meantime, a seasonal sight, because I’ve never been here around Easter before and I have been utterly taken with the way the grocery shops are filled with cakes shaped like lambs. This weekend, I head to Berlin for 48 hours I have desperately wanted to have since I was 16. I can’t wait. I’m also terrified. I’ll try to do some writing about Glee or other pop-culture items this week before that trip, but that particular travel update is probably also going to be entirely about pop-culture because Berlin is where art tells me the entirely of the 20th century happened, and when I was in high school, a song called “Heroes” saved my life. That’s a big marker in my life too. Horrifying anti-semitism… hope you get to somewhere a little less creepy too. It’s interesting. When I was living in Zurich I never encountered any anti-semitism (and Zurich has a very large and very visible religious Jewish community), but going to services on the High Holidays was…interesting. In some ways, it was more stringent than the security I went through to fly to Switzerland in the first place; I was questioned about who I was, how I found out about the synagogue (Or Chadash, http://www.jlg.ch/home, which was right down the street from where I lived), if I was Jewish, what my Hebrew name was, could I show them my passport, etc. And I had to be buzzed through an airlock. 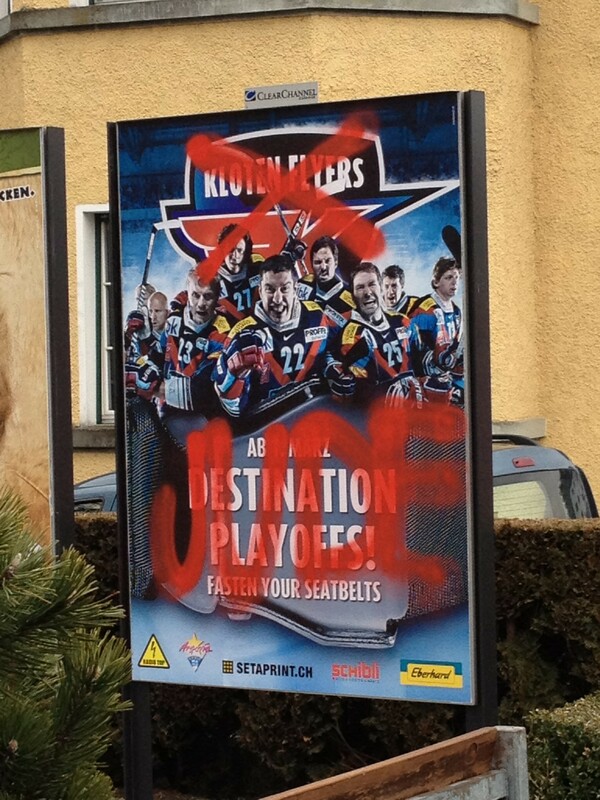 But the racism was definitely evident; there were ads in Zurich in main areas that just shocked me.